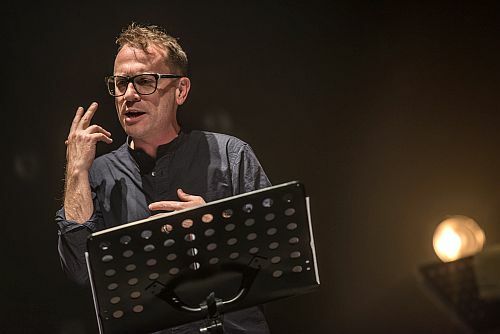 Torquil Campbell‘s one person show True Crime is on tour and Wednesday night was the opening of a short Toronto run at Streetcar Crowsnest‘s Scotiabank Community Theatre. It’s the story of Campbell’s interest in (or obsession with) Christian Karl Gerhartsreiter aka Clark Rockefeller, a conman who’s now in prison in California. It’s a play about a play, specifically about Campbell making this play; about going to see Gerhartsreiter in prison, or not going to see Gerhartsreiter in prison. The audience doesn’t really know what’s true and what isn’t. It doesn’t matter. It’s about the play and the performance and both were wonderful. Campbell, director Chris Abraham, and composer Julian Brown are all credited as co-creators. The writing is beautiful. Early in the play Campbell is talking about his father, the late actor Douglas Campbell, and says “My father has left stories lying on the ground for me to pick up.” I love that line. Remington North’s set reflects Campbell’s love of Patricia Highsmith’s novels and noir crime. Lots of haze, so thick that it’s hard to see Julian Brown and his guitar at the back of the stage. Campbell is at the front of the stage, isolated by lighting; like seeing someone under a streetlamp on a foggy night. It reinforces the isolation that Campbell seemed to experience when he was researching and writing the play. His wife was not happy with him and wanted him to stop. It was a very emotional time, he flipped between disliking Rockefeller intensely to admiring him and wanting his approval. He wavered between thinking the project was stupid and wanting to dump it and being excited about it and eager to finish it. Until he wrote and performed True Crime, Campbell had been away from acting in theatre for 16 years. You would never know it, his stage presence is remarkable. Sometimes he’s big and loud and angry and other times he’s quiet and reflective. Great comic timing too, he knows just when to deliver the line and how long to wait for the laugh. It’s a joy to watch him. He plays two characters, himself, a stage version of himself and Rockefeller. As Rockefeller he’s quite flamboyant and personable, self-effacing in the way that people are when they want to draw attention to themselves. He has the slightest trace of a German accent. He’s almost charming. Until the jail visits (that might not have actually happened), then Rockefeller becomes frightening. Still pleasant on the surface but threatening underneath. Brown’s guitar accompaniment works to enhance the atmosphere and emotion. I can’t actually say whether he played all the time but when I did notice the music it always seemed right. So do the songs that Campbell wrote and sang, ostensibly as a result of his visits (or not) to Rockefeller. There’s one where he barked at places in the chorus that struck me as pretty funny. My friend Elaine and I enjoy everything about True Crime. There’s nothing we don’t love. We highly recommend it. If you want to see it, buy your tickets right this minute. I just checked and the only show left with good availability is Friday at 11:00 pm. True Crime is playing until January 20, 2018 at Streetcar Crowsnest (345 Carlaw Ave). Showtimes are Thursday through Saturday at 8:30 pm, Friday at 11:00 pm, Saturday at 1:30 pm. Tickets range from $20 – $50 and are available online.